And seriously, I know I say this all the time, but it couldn’t be much easier. 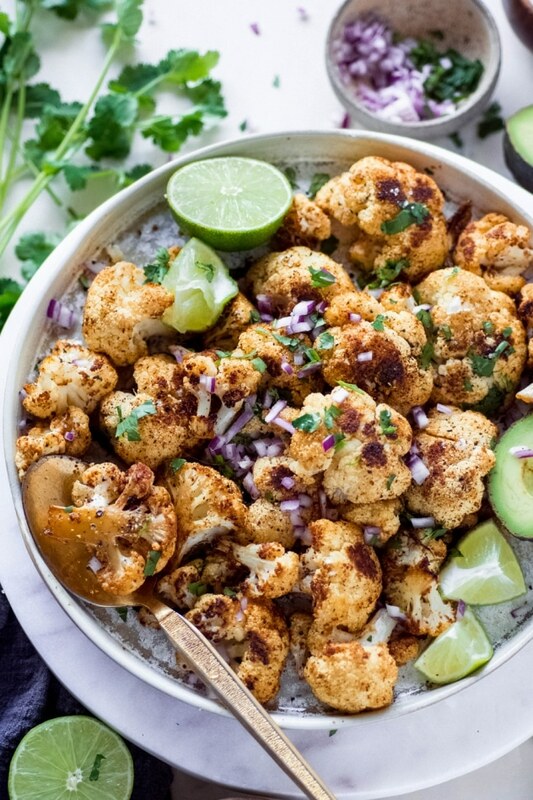 Essentially mexican roasted cauliflower is made the same way that you would make a more simple pan of this yummy veggie. All I did here was add a few spices that you most likely already have in your spice rack before roasting, and then chopped up some fresh herbs, red onion, and sliced some lime wedges to finish off the dish once it comes out of the oven. 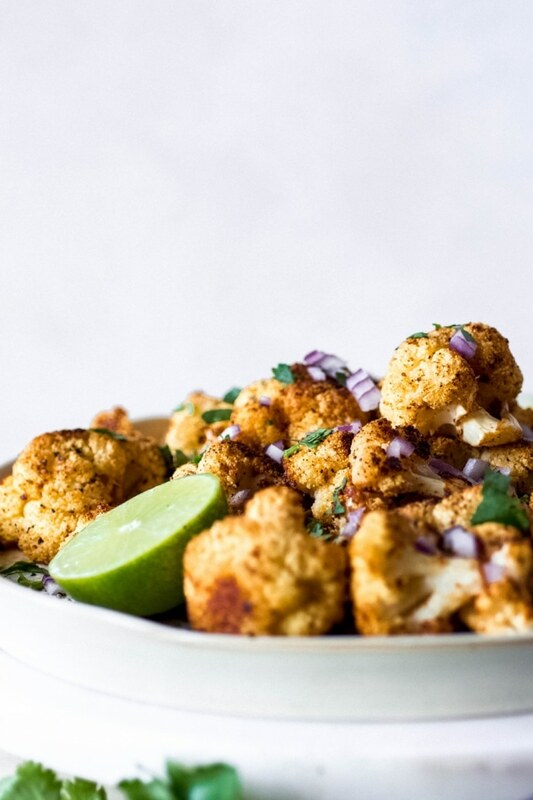 This simple flavor additions are the magic making ingredients to take your roasted cauliflower from good to CRAZY DELICIOUS. If your oven is not hot enough the cauliflower will just get soft and mushy before it has a chance to crisp up and caramelize. And then even if your oven is hot enough, if the baking pan is over crowded, the cauliflower will steam before it has a chance to crisp up. 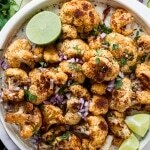 Follow the recipe below and you will be enjoying CRISPY, tender, flavorful mexican roasted cauliflower in no time. And to top it off this recipe is gluten free, paleo, vegan, AND whole30 friendly. A win/win for anyone your feeding – yourself, your family, some friends, or a beautiful combination of all three. 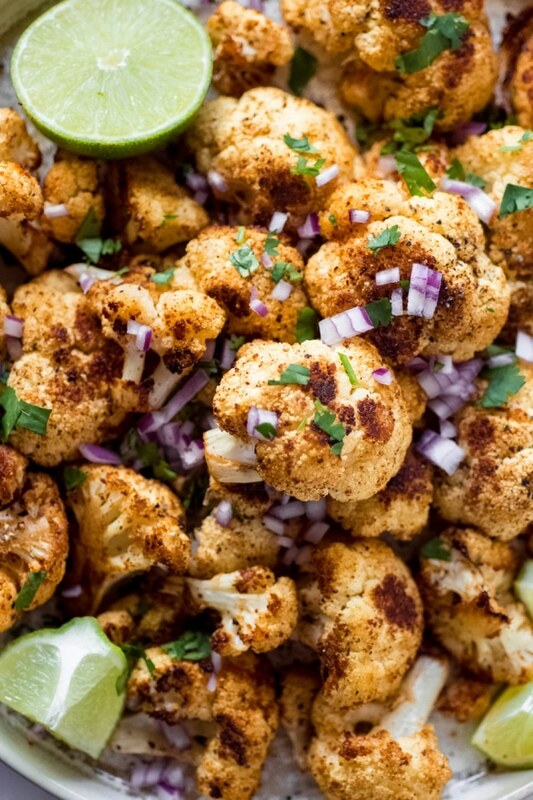 Toss cauliflower florets with avocado oil, dried spices, and salt + pepper. Make sure the spices look pretty well distributed. Spread evenly on a baking sheet lined with parchment paper or a silicone mat and roast for about 20 minutes. 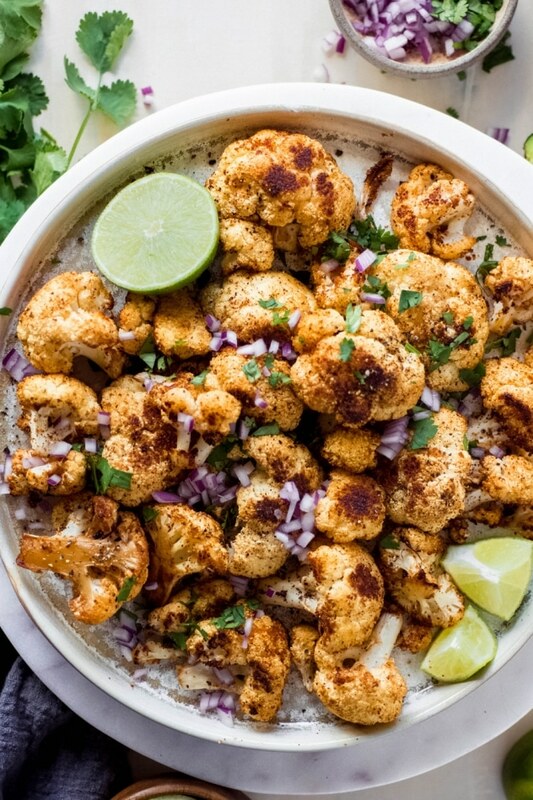 Remove from the oven and flip cauliflower so it can brown evenly, and roast another 10-12 minutes or so, until tender, crisp on the edges, and nice and caramelized. Remove from the oven and serve topped with fresh cilantro, red or green onion and lime wedges + avocado for some extra healthy fat! Hi Janette! I would substitute coconut oil or peanut oil since they’re both good for high heat. Olive oil would work, too, but it’s not as stable for high heat cooking. I think they all would taste just fine ☺️ If your coconut oil is virgin (or unrefined), it might impart a coconut taste, but refined coconut oil has a fairly neutral flavor. Thank you so much for commenting and making recipes!! I hope you enjoy this cauliflower – it’s one of our favorite side dishes! !